This premium roller banner has a hidden base thanks to its front loading graphic system. You eco-graphic will be at full focus, perfect for events, exhbitions, conferences and retail areas. The hidden base also has 4 adjustable feet so your banner can stay perfectly upright on slightly uneven surfaces. 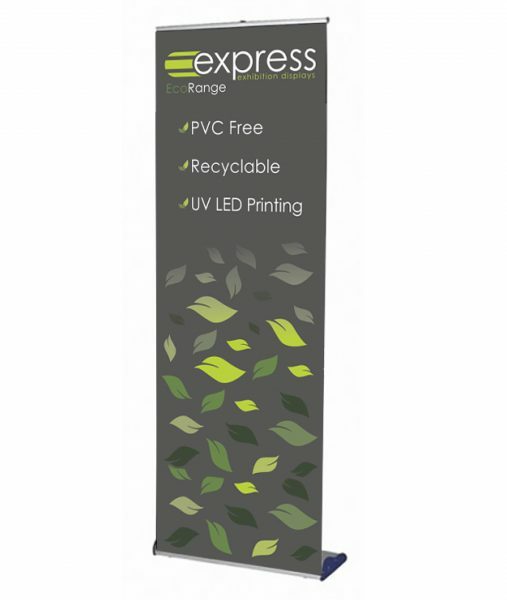 Our eco-graphic is printed on polypropylene, a 100% PVC free and recyclable material. Looking to recycle the graphic? We can do this for you free of charge. Please contact us for more information. The ink used is also eco-compliant, free of any VOCs (volatile organic compounds) and an energy saving UV LED print process is also used. Connect the three part pole together. Insert one end of the pole into the base unit. Slowly pull up the banner and fit to the top of the pole.